Looking for Scaffolders in Bognor Regis? If you are looking for trusted scaffolders in Bognor Regis, Airo are here for you. With over 20 years' of experience in the scaffolding industry, our trusted family-run firm can help you with whatever you need. Whether you are renovating or painting your house or you are a commercial contractor looking for a reliable local scaffolding company, please get in touch. Over the years we have worked on projects ranging from tiny installations right through to huge housing development projects. Most of our customers come to us after being referred from previous customers - always a sign that we can be relied on as there's no better way to judge a firm than by using a friend's trusted opinion. However we have also signed up to the Checkatrade web site where you can see independent reviews of our work which cover the workmanship, our staff and how well the quote matched the final price. We have been working in the industry and in the local area for a long time so we have come to know other tradesmen such as painters, plasterers, electricians and others so if you need other work carrying out, we can recommend others to you. We are always happy to give advice and guidance if needed. If you need something slightly different or you are not sure, please get in touch. We are always happy to help and we can come to the site and give a quotation including details on how long it will take to erect the scaffolding and note any special requirements. With years' of experience in the industry so are more than happy to let you know what you need and to make you aware of any potential issues. The scaffolding can be put in place to reach any floor of your building and we always like to know exactly what your requirements are so that we can be as helpful as possible. 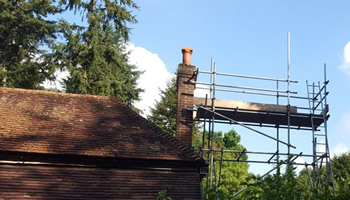 Often scaffolders are asked to put a structure in place for one job, such as painting the external walls of a house, but once up there you may notice that a chimney needs working on or the roof needs a tile replacing. It's often a good idea to have the scaffolding erected so that all areas of the building can be accessed when it is first put in place, rather than waiting and adding it on later. When the work is nearing completion you can let us know when you would like the structure removed and we will book it into our work schedule for you. Removal is comparatively quick and we will work to your schedule to make sure the site is clear of all equipment as soon as possible. We operate across West Sussex so if you are in a neighbouring area, just get in touch. Erecting scaffolding is completely dependant on the size of your building. If you are in a rush and need something erecting quickly, do let us know. We can usually have someone on site within 24 hours to discuss your plans, create a quote and arrange installation. Taking down scaffolding once your project has completed is much quicker and easier. As with all of our customers, we always try to get as much information from you as possible before we start to ensure we can meet your expectations. Hiring scaffolding can vary depending on a number of factors. These include the size of the project, how long you want to hire it for, whether you need us to install the scaffolding or if you are happy to do it yourself and whether you need us to take it down afterwards. You also need to consider that different companies will charge more than others but as with anything in life, it's good to remember 'you get what you pay for'. There are some companies that will give you a low installation fee but the daily rental charge is much higher and therefore the actual project may end up costing you more than you had hoped. It's important to have a full site survey and discuss your project fully. We will always provide you with a detailed, written quotation explaining exactly what we will do for you and the costs involved. There are no hidden charges or extras, everything will be detailed on your quote so that you can decide if you want to go ahead or not. We are always happy to come out and visit to discuss the available options with you and being on site allows us to provide an accurate quote. It's also useful for us to meet you and fully understand the project. We can sometimes provide advice that will save you time or trouble in the future. We can also ensure we are aware of exactly what you need doing and when. We always provide free quotations and answer any questions that you may have. We are based in Petworth but have customers and work right across West Sussex. Our gallery contains images of projects right across the county from home maintenance projects to large developments. It's quite likely that you have seen some of our advertising banners on scaffold installations so our name may sound familiar to you. Are you listed on Checkatrade? Yes we are. Checkatrade are known to most people and carry out various check on companies to ensure they meet their high standards. Being listed on their site is a rigorous process. We have to provide documentation such as identification, insurance documents, postal address check and references from previous customers. All of this is to ensure that only genuine, honest and reliable businesses are able to become members. "Scaffolding job was excellent they spent much more than estimated time to do a tricky job and to a very high standard. I would recommend this company." "Very good / reliable and good prices." As well as the above, you can see more reviews on our Checkatrade page. We are extremely proud of our reviews and our track record so please do take a look so you can see what people say about us. Whether you are a home owner hoping to get scaffolding erected so that you can take care of some maintenance or paint the outside of your house, or you need access to the roof for some repairs, we can advise you on what needs doing and when. We are always available to offer guidance or provide a quote so if you are looking for a trusted scaffolder in Bognor Regis, please give Alan a call on 01798 368080 or you can e-mail us via our contact page. You can also return to our home page for more information.